Dr. Schellack graduated with honors from Tulane University. In 1980 he earned his Doctor of Medicine degree from LSU Medical Center in New Orleans. In 1985, Dr. Schellack completed a five-year surgery residency at Emory University in Atlanta, Georgia. He then completed his vascular training, graduating from Emory University’s Vascular Surgery Fellowship. Since 1987 Dr. Schellack has performed thousands of operations and interventional vascular procedures at area hospitals. He is widely-known and well-respected in South Louisiana as a leader in vascular care. He has published articles in the field of vascular surgery and is an active participant in the country’s leading regional and national vascular societies. 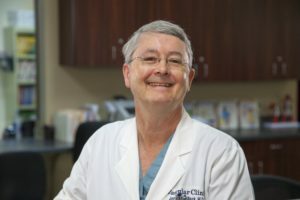 He has been actively involved in teaching LSU surgical residents since 1987. Board certified in both general surgery and vascular surgery, Dr. Schellack is also a registered vascular technologist and a Fellow of the American College of Surgeons. Dr Schellack’s areas of expertise include limb salvage surgery, creation of angio access in complex dialysis patients, surgical treatment of thoracic outlet syndrome, abdominal and thoracoabdominal aortic aneurysm repair, treatment of carotid disease and varicose veins. This symbol designates surgeons who are Fellows of the American College of Surgeons. Surgeons who display this symbol are dedicated to the highest standards of patient care and continuing development of professional skills and competence. For more information about F.A.C.S, click on the above logo image.